For the first time ever, a NASA mission will bring back a sample from a distant asteroid. That sample will be a chemical time-capsule from the birth of the Solar System, 4.5 billion years ago. It will provide vital clues about the formation of our Solar System and the origins of life on Earth. This groundbreaking NASA mission is called OSIRIS-REx. The University of Arizona leads the OSIRIS-REx mission for NASA. The science Operations Center is based right here in Tucson. In September 2016, the OSIRIS-REx spacecraft launched from the Kennedy Space Center at Cape Canaveral, Florida. Over the past two years, the spacecraft has traveled more than 1.2 billion miles to reach its target asteroid, Bennu. OSIRIS-REx arrives at Bennu on Monday, December 3. To celebrate the spacecraft’s arrival, Flandrau Science Center & Planetarium will host a full weekend event called ASTEROID AHOY! NASA’s OSIRIS-REX ARRIVES AT BENNU. Just two years into the seven year round-trip journey, this major milestone gives us an opportunity to update the public on this mission of discovery. Once the spacecraft reaches Bennu, it will it will orbit with the asteroid, scan it with a sophisticated suite of instruments, and determine the perfect place to grab a sample. During the ASTEROID AHOY! weekend, visitors can learn about the OSIRIS-REx mission in free presentations from UA scientists who actually work on the mission. On Saturday Dec. 1 at 2pm, Dr. Bashar Rizk, the OCAMS Instrument Scientist for the mission, will give a presentation about the spacecraft’s arrival at Bennu and the next steps for the instruments on board. OCAMS is the shorthand name for the “OSIRIS-REx Camera Suite,” a set of three highly specialized cameras built by UA for the mission. Those cameras are the “eyes” of the spacecraft. Then on Sunday at 2pm, Dr. Dante Lauretta, the mission’s Principal Investigator (leader) will give an overview presentation about what the arrival means for the mission, what comes next, and the exciting science that lies ahead. Both presentations will be followed by a screening of the fulldome planetarium show ASTEROID: MISSION EXTREME, all about the science and potential of asteroids – in this show you’ll feel like you’re an astronaut visiting an asteroid! Special hands-on activities that help visitors learn about the mission will also be offered by trained “OSIRIS-REx Ambassadors,” so inquisitive minds of all ages can grasp how the spacecraft works, understand the ingenious instruments it carries, and see how it will collect the all-important sample. Additional family-friendly activities will be provided by Flandrau staff. All activities offered 1-4pm both Saturday and Sunday. Dante Lauretta, UA Professor and lead scientist for the OSIRIS-REx mission, is also a board game designer. After his 2pm presentation, Dr. Lauretta will be available at 3pm on Sunday, December 2 in the lobby at Flandrau to sign copies of the two games he has designed: Xtronaut: The Game of Solar System Explorationand Constellations: The Game of Stargazing and the Night Sky. Both games will be available for purchase in the Flandrau gift shop and make great Christmas gifts. 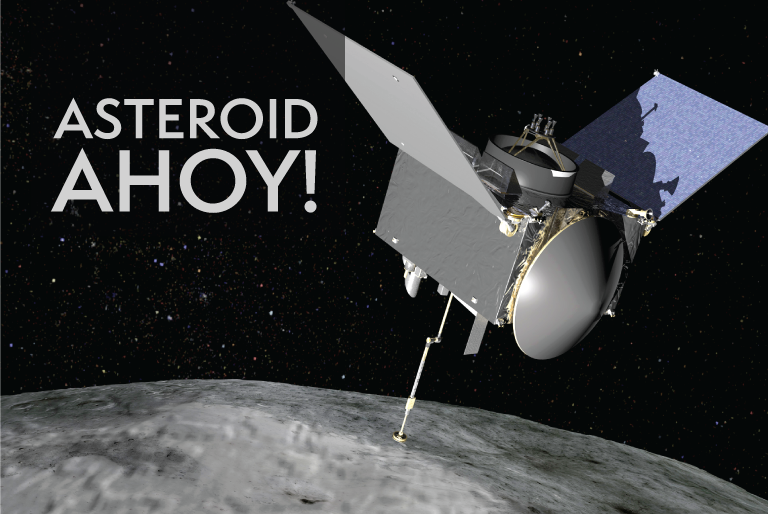 Come celebrate this OSIRIS-REx mission milestone with the whole Tucson community at ASTEROID AHOY! When: Saturday & Sunday, December 1 & 2. 1pm to 4pm. What: Special free OSIRIS-REx presentations, special asteroid planetarium shows, special asteroid activities. Cost: Special discounted $4 general admission. Free OSIRIS-REx science presentations. Regular price planetarium shows: $8 for adults, $6 for kids.